Are Indian players the world's best-paid cricketers? And where does cricket stand among other sports in terms of player remuneration? The highest-earning captain in international cricket in 2017 stands to make nearly 20 times as much as the lowest-earning; the top cricketers in the world earn around US$1 million from playing international cricket; the top Pakistani annual contract is worth less in monetary terms than the top Ireland one; and coaching a subcontinent side, though bad for job security, is great for the bank balance. These are some of the key findings from figures collected by ESPNcricinfo in a survey of central contract salaries and match fees around the world. The headline is that Steven Smith, the Australia captain, will earn US$1.469 million this year, while his Zimbabwean counterpart Graeme Cremer stands to earn $86,000. The top Indian earners in international cricket are Virat Kohli, the captain, who pulled in approximately $1 million this year, and coach Ravi Shastri, whose annual salary of $1.17 million is comparable to that of any of the game's top players. The figures are based on international cricket, and do not take into account player earnings from T20 leagues, other domestic engagements or endorsements. Most boards (see below*) pay their players a share of their commercial rights, while others don't, or distribute them differently. The pay figures in this piece do not include the various bonuses players are paid for wins and individual performances. Factoring all those in might shuffle the rankings, but that is likelier to happen at the top of the list. And if anything, it will increase the disparity in earnings between top and bottom. What is crystal clear is that the richer cricket has become, the more inequality it has bred. That, you might say, is a modern truism of the game, but as the calendar is being fundamentally reshaped by domestic T20 leagues and the riches they offer players, the magnitude of that inequality should serve as a clear warning to the international game. In most cases salary figures and contract details are not made available publicly; the information in this article, culled from their contacts by our correspondents from around the globe, strives to be as accurate as is possible. *Players from England, Australia, South Africa and New Zealand receive a share of their board's commercial earnings as a guaranteed part of their contracts. Some boards, like Cricket South Africa and CA add these payments to the retainer. The BCCI pays 26% of its gross revenue every year to its players; half of that is distributed among international players. How much each players gets, however, is calculated based on the number of matches they play. The ECB pays the following approximate amounts according to player contract grade: $180,000 (top), $80,000 (mid), $30,000 (lowest). This payment, however, is linked to commercial obligations each player fulfils, and so varies from player to player. It is also not clear whether this is an additional payment on top of each retainer, or whether it is factored into the retainer amounts. 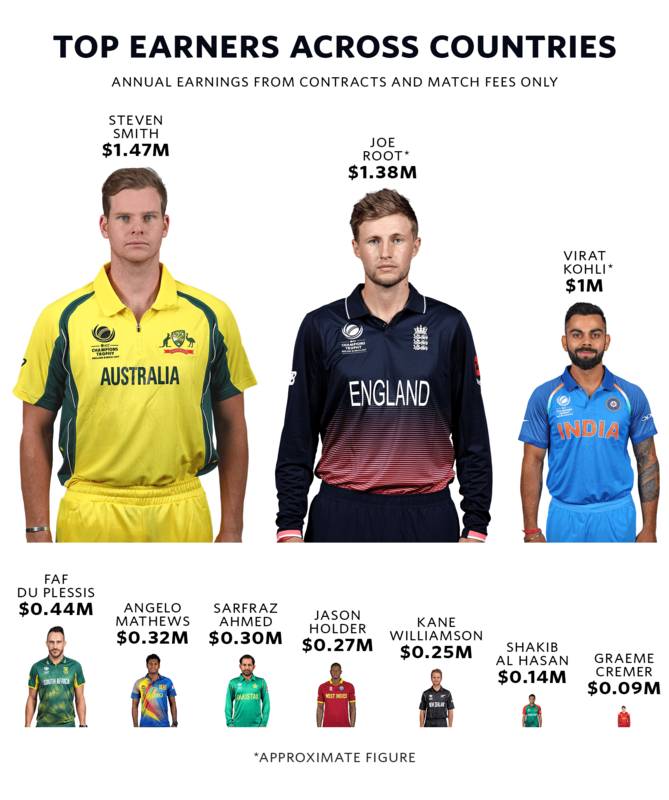 For the purposes of this article, we have taken the payment to be part of the total retainer amount - if, however, you add on the full $180,000 to, say, Joe Root's total earnings, he nudges slightly ahead of Steven Smith as the highest earner. The BCB does not pay any money from its commercial rights earnings to its players. Pakistan's players receive a certain amount - thought to be approximately $3000 per game - from the PCB's main sponsor as logo money, but this is restricted purely to the XI that plays in an international (and so goes also to players not in the central contracts pool). Because of the different ways in how commercial rights are distributed across the globe - or not - the total earnings figures you see can only be close approximates. We know that a clear divide has grown in cricket between the Big Three and the rest, the haves and the have-nots. What the total earnings figures show (based on the top-earning player in each country), however, is that there are actually four segments: an elite three of Australia, England and India; an upper-middle-class from South Africa; a middle-class quartet of Sri Lanka, Pakistan, West Indies and New Zealand; and finally, a working-class duo of Bangladeshi and Zimbabwean cricketers. 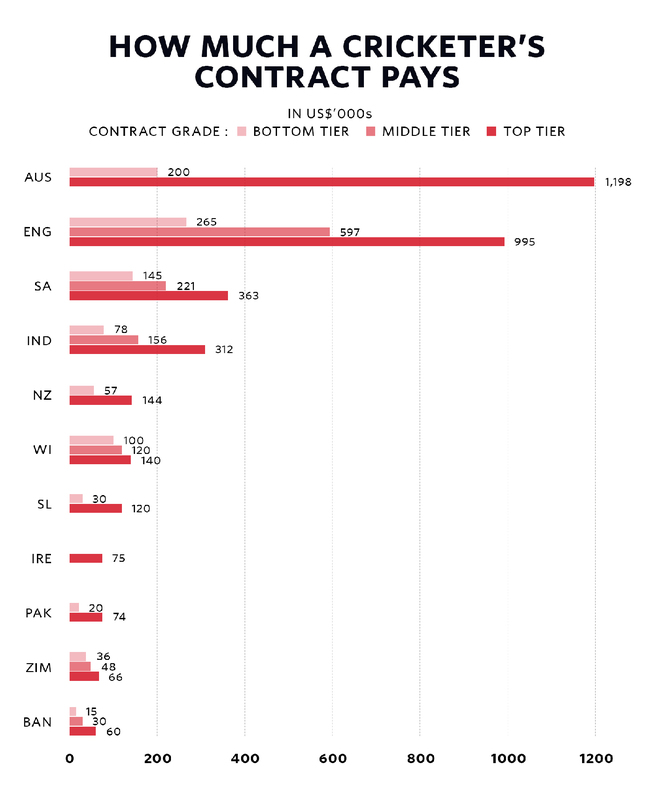 There are four divisions even when it comes to the lowest contract grades, though grouped differently: England and Australia in one; South Africa and West Indies another; India and New Zealand next; and then Zimbabwe, Sri Lanka, Pakistan and Bangladesh. The disparity remains - at about $265,000, an England player on the ECB's lowest contract (England group their contracts not in grades but in terms of red-ball, white-ball and all-format cricketers) still earns nearly 20 times as much as a Bangladesh player on the lowest contract ($15,000). Don't be fooled by the central contract figures. If you look only at the contract retainers (and not match-fees payments), Australia and England pay their top players nearly four and three times as much as India - where the top-grade contract is worth $311,745 - and even cash-strapped CSA pays its top player more. But the total payout an Indian player gets is a combination of his contract money and a percentage of the BCCI's gross revenue, calculated on the number of matches he has played in one calendar year. So Kohli, who has a Grade A contract, would earn his retainer plus his share from the 13% of gross revenue. Although no definite numbers for the last two years are available, Kohli's estimated income from his contract payments and his share of the board's revenue has been about $1 million - which places him in the top band of cricket's earners. If you factor in his earnings from the IPL and multiple individual endorsements it ends up making him probably the richest cricketer in reality. Still, India's contracted players are unhappy with their latest, upgraded annual retainers. In the new pay structure model presented by Anil Kumble to the BCCI in May, while he was still coach, he had argued the team should get a share from the board's media rights. That discontent is additional fuel for those - including the Lodha Committee, incidentally - who feel India needs to establish a players' association. Australia and England, not coincidentally, both have well established player bodies, but the examples of South Africa, New Zealand and West Indies are instructive. 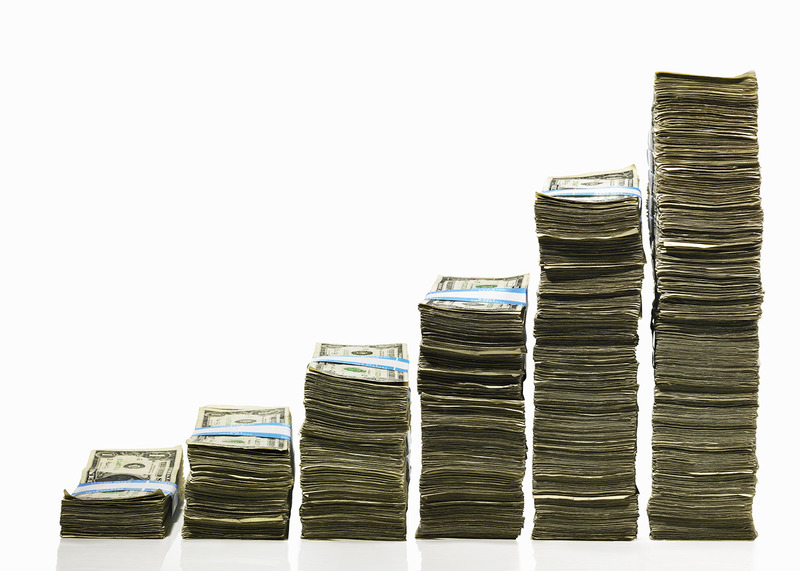 Despite being among the smaller boards in terms of revenues, the existence of SACA, NZPA and WIPA means their players are relatively well remunerated. South Africa's top contract is worth $363,000 per year, in the Caribbean the top contract is worth $140,000, and in New Zealand it is $143,533. This year both Jason Holder and Kane Williamson have earned over $260,000 leading their countries. A raw deal for Pakistan? They won the Champions Trophy in June, were the No. 1-ranked Test side as recently as October last year, and have only just lost their first series at home in ten years, but Pakistan's players are among the worst paid in world cricket. A player in Pakistan's top contract bracket will be on an annual retainer ($74,014) that is marginally less than the top contract for an Ireland player ($75,000). Let that sink in (Ireland's top salary retainer is also higher than those of Bangladesh and Zimbabwe). A player like Sarfraz Ahmed, Pakistan's captain, will end up earning more in a year, of course - and he quadruples his base salary in 2017 - because he plays more often and plays across three formats. To some degree the low retainer is compensated by a more generous match-fee structure that elevates them to a mid-ranking side in terms of pay. But Pakistani players will argue their plight is compounded by a lack of access to the richest domestic league in the sport, or an especially bountiful payout from the PCB's commercial rights. The years of exile have played a part no doubt, as has India refusing to play them (that has also significantly reduced the true value of a broadcast deal reportedly worth $150 million over five years). The cost of running an excessively vast domestic calendar is another drain. The PCB earns revenue comparable to West Indies, New Zealand and Sri Lanka, and so the vast differences in retainer amounts between Pakistani players and those representing those three countries stands out: Kane Williamson, Jason Holder and Angelo Mathews all make double, or nearly double, what Sarfraz does on their retainer. Sarfraz makes up for it with his total earnings, but such a system puts intense pressure on the player; an injury in Sarfraz's case is of far greater harm monetarily than it is for Mathews, Williamson or Holder. Like with India, the case for setting up a Pakistani players' association has never been stronger. One possible reason why Indian players don't receive the same basic retainer as Australian and English ones, or Pakistanis as much as New Zealanders and West Indians, is the size of the teams' central contract pools. The BCCI and PCB could both argue that they offer financial stability to a far larger pool of players than most other countries do. India has 32 centrally contracted cricketers and Pakistan, with 35, has the largest pool in cricket. By bringing more players into the net, they bring to the game a greater semblance of equality in itself (the fact that these two countries are also the two largest, population-wise, among the cricket nations, plays a role). By contrast, England has an 18-man central contract list and Australia a 20-man one. West Indies pay more to their players than Pakistan but they contract only 15 players. Sri Lanka is an interesting case. There are 17 players with top-tier national contracts, where the bottom contract is approximately $30,000 annually. Beyond that, they have a group of 30 more who are also on annual contracts, worth anywhere between $10,000 and $30,000. The BCCI's commitment to Test cricket often comes under scrutiny. It is a bum rap, not least in the evidence of how well it pays those who do play Test cricket. 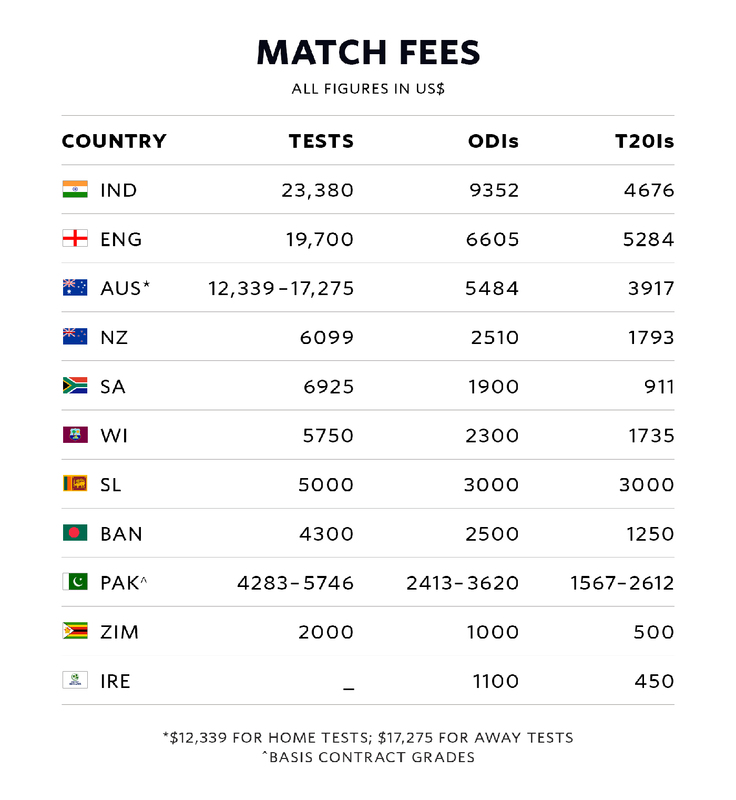 At $23,380 per game, India's Test cricketers are the most well rewarded across the world, earning almost twice what an Australian cricketer gets paid for a home Test (Australia has different fees for home and away Tests). Again the gaps are stark. The lowest Test-match fee for a player from one of the Big Three boards is still nearly double that of the best paid from the seven beyond. 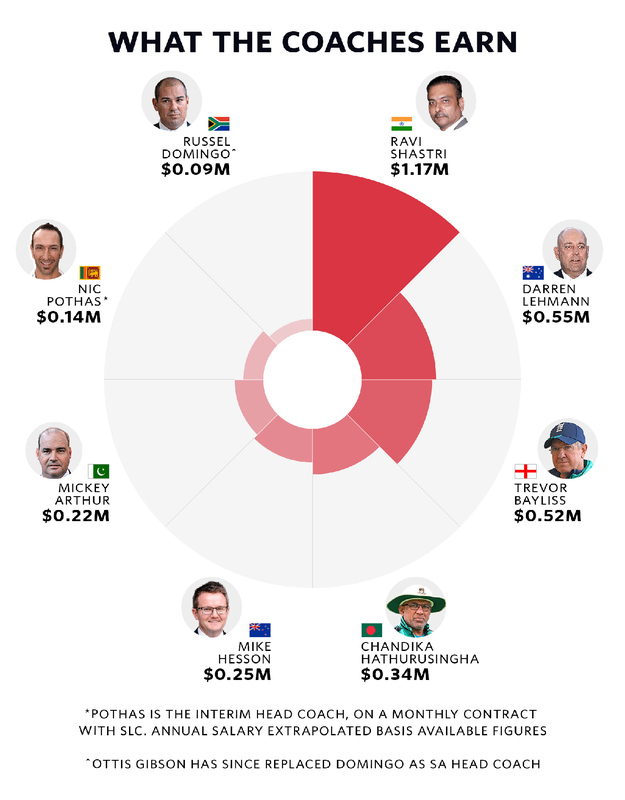 But paying the head coach that much more than the top players seems to be a South Asian trend. The BCB pay Chandika Hathurasingha five times the basic salary of their top player; similarly Mickey Arthur is paid three times as much as a top category Pakistan player; Sri Lanka were paying their last full-time coach, Graham Ford, twice what their top player was paid. Perhaps it is because, historically, it is in these countries that the coach's position has been the most vulnerable: the high-risk nature of a subcontinent job means attracting someone, especially from outside the region, requires that much more money. By contrast, Australia and England pay their coach around half of what their top player earns as a basic salary. 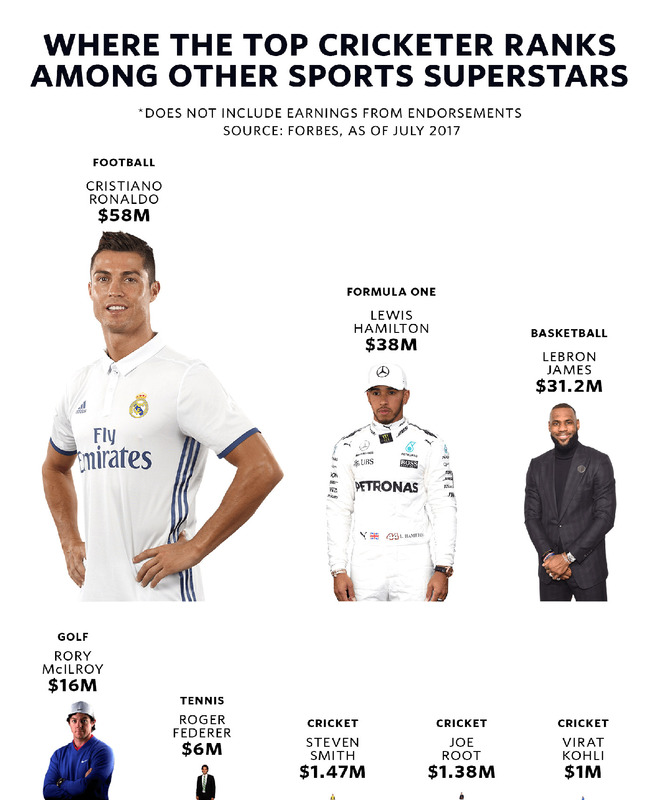 The world's leading footballers, tennis players, basketball players, golfers and Formula One drivers earn so much more than the leading cricketer that to say cricket is a professional sport feels far-fetched. Cristiano Ronaldo, for instance, earns 40 times as much as Steven Smith just on annual salary; Lewis Hamilton earns 25 times as much; LeBron James 20 times as much; and it goes on. If you account for the individual endorsement fees and various other sources of income - most notably T20 league contracts - that exist for the richest cricketers like Kohli and MS Dhoni, the gap between them and elite athletes from football and basketball would still be vast (since the top cricketers' earnings would still only be somewhere around $3 million). Cricket claims to be among the world's leading and most popular sports, and its stated aim is to become the world's favourite sport. If it measured itself in terms of how well its players are paid, it would be laughed off the field.